Length of Walk: 3 mile walk around scenic Heather Farm Park. A shortcut/wheelchair/stroller route is available. Parking: Free parking is available within Heather Farm Park in lots near the baseball fields and community center on N. San Carlos Drive. There is an additional lot at the swim center on Heather Drive. Handicapped parking available. We are expecting 1,000 walkers and there may be other events occurring at the park at the same time, therefore we recommend giving ample time to find parking and strongly encourage carpooling. Other: Wheelchairs, strollers, and friendly dogs on leashes are welcome. We recommend that you dress for all weather (layers) - in years past we have had chilly mornings and clear/sunny afternoons. Please bring your own water bottle to accompany you on the walk. Registration: All walkers must register online, prior to the event. Donation Collection: Donations can be collected the morning of the event at check-in. Donations can also be made online by credit card. Donations can also be made by participating on a team, or given to a team leader/member directly to be collected at the event. 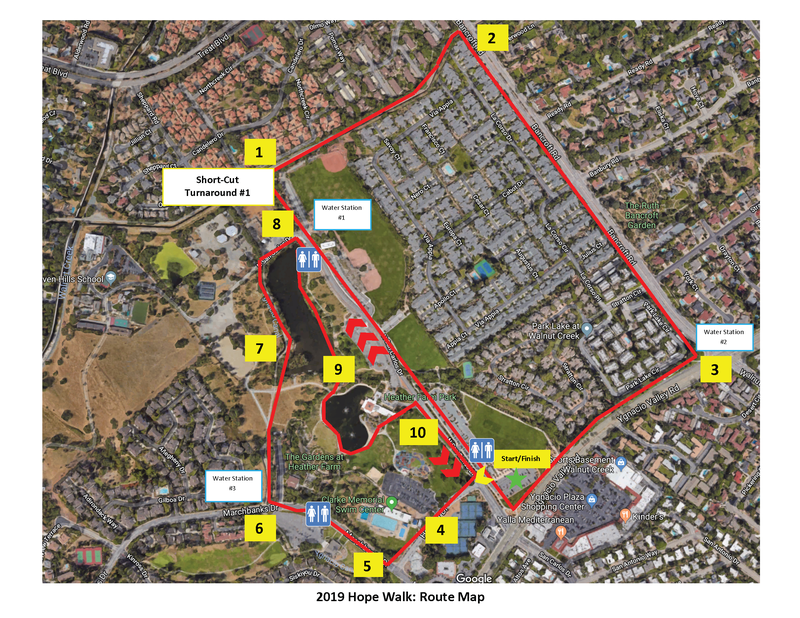 Event T-Shirts: Hope Walk T-Shirts will be made available for pick-up at Sports Basement in Walnut Creek, prior to the Hope Walk on May 18th during Early Bird Check-In on May 16th and 17th (details below). They will also be available to registered participants the day of the walk. To guarantee a shirt is available for you prior to the event, we strongly recommend you participate in the Early Bird check-in at Sports Basement. Food/Beverage: Some free food and beverages will be available to attendees at the event (while supplies last). 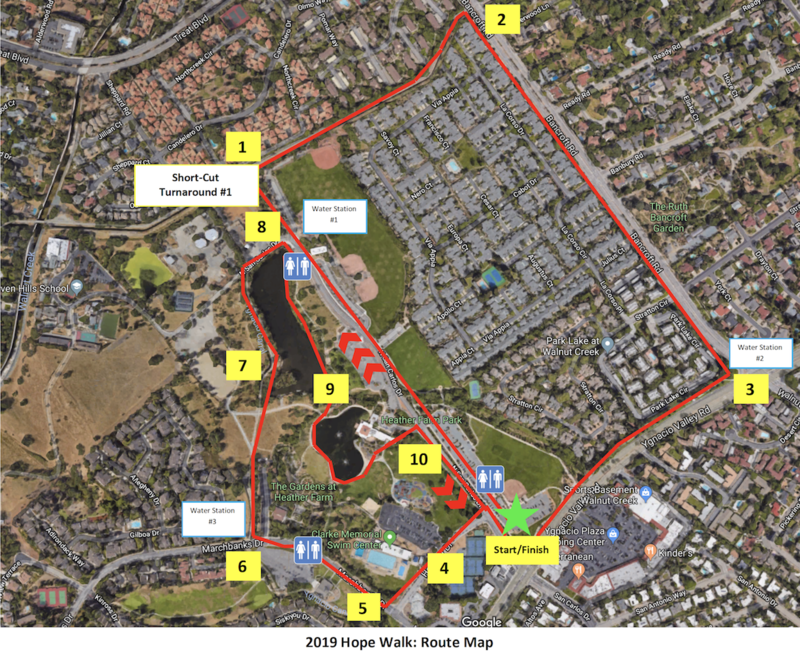 Route: Below is the tentative map of the Hope Walk route. Please note, this route is subject to change without notice. Download the current map here. You can pick-up your shirt and swag bag early! All registrants have the option to pick-up their items before the event day, allowing you to bypass the check-in the morning of the walk. Items will be available at SPORTS BASEMENT in Walnut Creek two days leading up to Hope Walk. The fundraising prizes can be earned by individual fundraisers and will be distributed at Sports Basement (Early Bird Check-In) or the morning of the Hope Walk. These prizes are cumulative and eligibility is based on individual fundraising totals only, not team totals. Eligibility (cut off/fundraising totals) will be determined on Wednesday, May 15, 2019. Winners will be announced at the Hope Walk on Saturday, May 18th. BEST TEAM COSTUME The team with the funniest, wackiest, most creative costumes will win a fun prize for the group. BEST INDIVIDUAL COSTUME The individual with the best, most creative costume will win an individual prize. TOP TEAM FUNDRAISER The team that has raised the most funds by the day of the walk will win a prize for the group. TOP INDIVIDUAL FUNDRAISER The individual who has raised the most funds by the day of the walk will win an individual prize.